Looking for an easy appetizer that is full of protein? 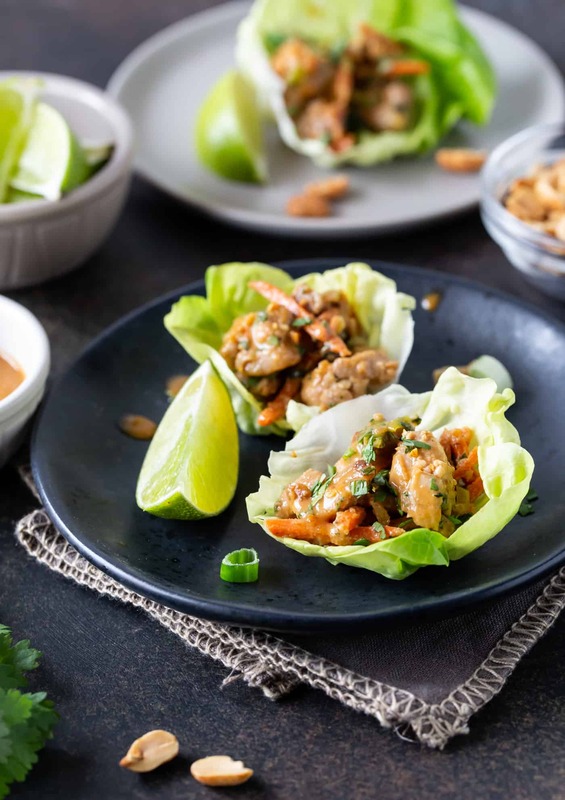 These Thai Peanut Chicken Lettuce Wraps filled with crunchy peanuts and topped with fresh cilantro hit it out of the park. The holidays are here and that means that it is party season. 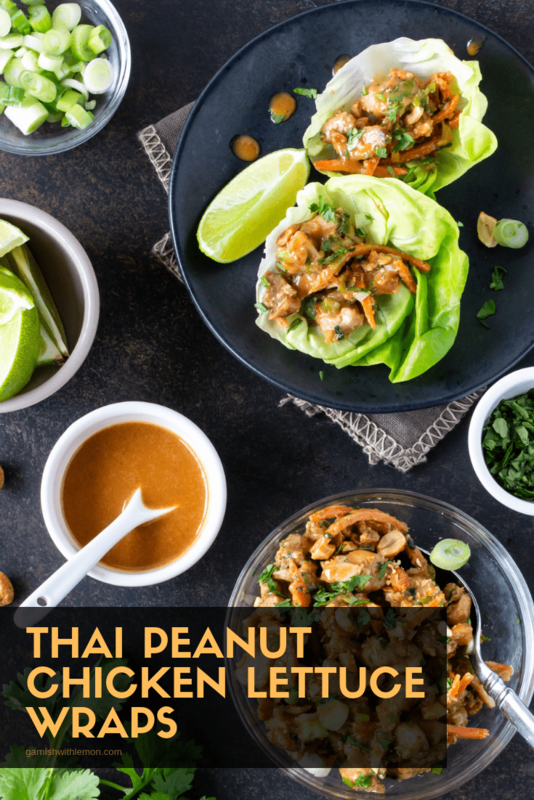 These Thai Peanut Chicken Lettuce Wraps are just what your appetizer menu needs. Rich, satisfying and full of peanut flavor, they will be the first snack to disappear from the table. It’s easy. You only need to stir a handful of ingredients together, no stovetop required to make this rich sauce. Not only is it easy to make, but the sauce does double duty as a marinade too. It is the key to this Thai peanut appetizer. How do you marinate the chicken? The first step is to start with high quality chicken. We love Gold’n Plump® Boneless Skinless Chicken Thighs. Gold’n Plump chickens are raised on family farms right here in Minnesota and Wisconsin and are vegetable and grain fed. Gold’n Plump chicken products have no added hormones*, no artificial ingredients, no preservatives and are ready-to-use straight from the package. Simply cube the chicken thighs and give it a quick soak in the peanut sauce to let the peanut flavor shine through. The longer it soaks, the more flavor it gets. I love to marinate for a few hours to get optimum peanut taste. How do I serve the Thai Peanut Chicken? We love it as appetizers in these baby lettuce cups or as a main dish over cilantro rice. However you serve it, don’t forget the cilantro garnish and the extra peanut sauce for dipping. They are the icing on the cake. And after all, you can never have enough peanut goodness, At least not in my book. Can I make the Thai Peanut Chicken ahead of time? Absolutely. That is what makes it perfect for a party! Make it earlier in the day and simply reheat before serving. Add it to the lettuce cups, garnish and watch it disappear. Your guests will love these easy to eat, protein-filled bites of goodness. No one needs to know how easy they are. Your secret is safe with me! Disclosure: This post was sponsored by Gold’n Plump®. We only share products with you that we personally use and love. Thanks for supporting the brands that make Garnish with Lemon possible. *Federal regulation prohibit the use of hormones in poultry. 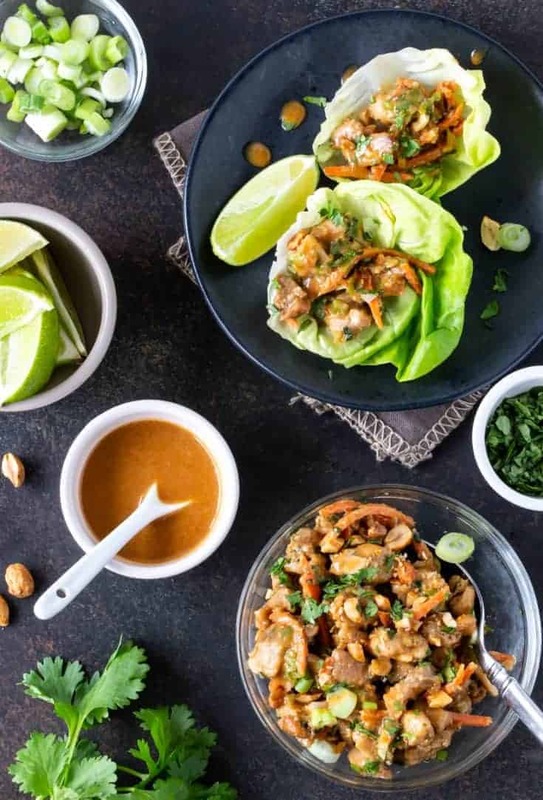 These Thai Peanut Chicken Lettuce wraps are packed with flavor! Stir all ingredients in a bowl. Use 1/3 cup of it for marinating and set the rest aside. 1. Place the cut chicken in a small bowl and 1/3 cup peanut sauce. Stir well to coat. Cover and refrigerate for 30 minutes-2 hours. minutes, stirring to turn the chicken pieces. cooked through. Add peanuts and cilantro and remove from heat.